Brighten up your home with a little "joie de vivre"! Filled with gorgeous photography and an abundance of helpful design ideas, this book will teach you how to create the cozy comfort of classic French style. Lots of new photography, a larger size and more detailed information is included in this brand new second edition. Anita includes a detailed tutorial for making her French bedspread using drop cloths for under $40. I&apos;m in love with this book. Anita has a gifted eye for design, mad photography skills and she can write! You&apos;ll want to skim through the book just to take in all the gorgeous photos...then you&apos;ll go back and read every chapter because Anita gives easy tips that will inspire you to look at your home with a new lens. I was excited after finishing the book...I&apos;ve been shopping my house and rearranging! I had just finished the design of a 2-bedroom apartment in French country style when I found this book on Amazon. Talk about great timing! Although it came to my attention a tick too late, I ordered it regardless as I was curious to see whether I had done everything more or less right. Happy to report that I was not too far off! Anita Joyce&apos;s "Farmhouse French" embraces many of the key features that I had incorporated into my own design: French chairs (especially the curvy ones), side tables (again the curvy ones), mirrors (you guessed it: the curvy ones), baskets (especially - the rectangular ones), wood accessories, French script on everything, silverware, soft furnishings in linen/grain sack, burlap, ... , traditional French fabrics (tapestry, ticking, toile), ironstone dishes, chipped paint, ironwork, ruffles and painted furniture. I was also relieved to learn that my omission to stick to French furniture exclusively did not seem important as Anita agrees that it does not really matter whether everything is genuinely French to create a French country look. In fact, it does not take many French items to make a room "appear French". French Country is (to paraphrase Lisa Frederick of houzz.com) a "simple and sincere yet effortlessly elegant style, which satisfies the soul as much as the eye". Step by step Anita Joyce&apos;s book helps you to get there. Whether you are looking for decoration guidelines, short tutorials on how to paint and distress furniture or sew slipcovers, want to learn how to confidently buy all things French at auction, or need beautifully illustrated examples of French country bed/living/you name it.... rooms - you find it all here. I read the book cover to cover, but will definitely keep it close by to serve as reference, should I ever be asked again to design a place in "French Country". I adore French decor and over the years have slowly been remodeling and redecorating my home to reflect the French style. 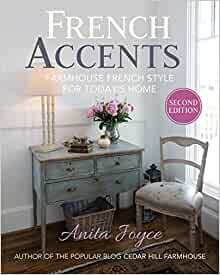 "French Accents" is a must have design book for anyone wanting to emulate this style. It is fabulous! 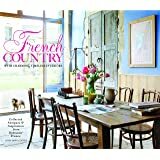 This book is so well done and filled with gorgeous, inspirational photos, with page after page of tips, examples, and step by step, easy to follow, instructions on achieving the French look in your own home. Anita&apos;s approach to French decorating is easy, charming, and down to earth, and it is reflected in the beautiful pages of "French Accents". Create the Farmhouse French style you crave on any budget. With hundreds of practical tips for incorporating French flair, this book combines solid design principles with DIY tips to turn your home into a one-of-a-kind masterpiece. Discover ‚ Where to begin when creating a new interior How to tastefully incorporate found objects and collections Where to shop for French furniture and décor How to create your own livable spaces using kitchens, dining rooms, living rooms, bathrooms, bedrooms, and more! In this second edition, enjoy new and enlarged photographs of your favorite classic French designs and expanded techniques for finding antique furniture, making bedspreads, and caring for vintage items. Filled with fun projects to get you started, this book is the perfect blend of French elegance and farmhouse chippy charm. In it you'll find an irresistible style you'll want to call your own, on a budget you can feel good about! Start reading French Accents on your Kindle in under a minute. I like Anita’s decorating style throughout her book. My favorite is her Dreamy Bedrooms and flowing ruffled bedspead! 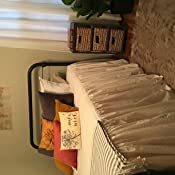 I made a bedspread using white muslin for my guest bed. Using her easy-to-follow pattern I finished it over a weekend! 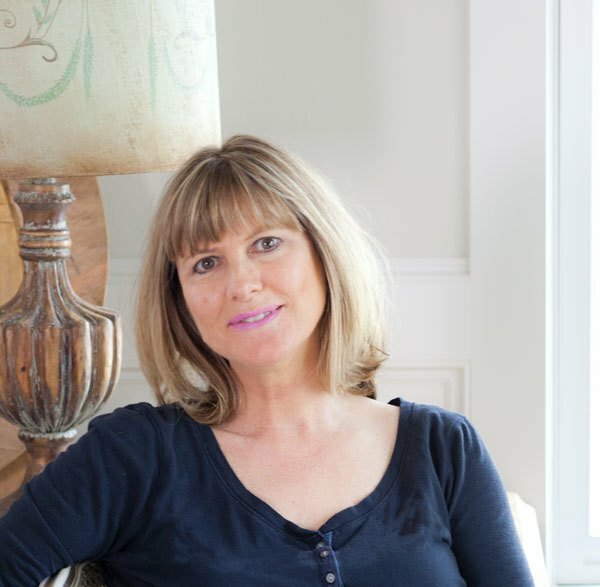 The author gives instructions for distressing/upcycling as well as making ruffled cushions and bed linen, while also sharing her shopping "secrets". The photos are well done and at the end of the book she shows the evolution of several rooms (invaluable content, in my opinion). I really enjoyed the variety and number of bedroom examples from her home and others. Bedrooms are so often blah, an afterthought - not so I'm this book, thank goodness! This is a comfortable, usable French style. There's nothing overly decayed or unattainable. The kindle edition has formatting flaws, but anyone who's paying attention can easy associate the correct photo to it's accompanying explanation. What a fun book! It is a great mix of eye candy, practical decorating advice, and how-to instructions for some great looking projects. I have enjoyed the author's blog for over a year now, and this book brings added dimension and detail to some of my favorite posts, as well as brand new material to enjoy. Can't wait to incorporate some of her tricks and ideas into my home! I was hoping for a more “authentic” view, it seemed like more of an Americanized view of French decor= not much new or unique while still pretty. I am enjoying the book, I wish there were more ideas for outdoor living as well. 5.0 out of 5 starsSolutions, answers and direction from a wonderful designer . Totally love this book. The author Joyce walks you through so many personal tastes of her own and assists the reader in every new project. Step by step shopping antiques, painting and distressing. This book is a huge inspiration for anyone who loves decorating their homes. I love it. Very well organized book. The author really walked you through all the trade secrets to have professional results. My only regret is that I ordered an e-book version. Great to read, but not the same as an old fashioned great book for my coffee table.